How does one choose from the amusement park's three dozen hotels? Since opening in 1971, Walt Disney World in Orlando has become an American family ritual. Nowadays, Disney World offers over three dozen hotels with different themes, clienteles, and rates. While every Disney hotel or resort is dependable and well-run, some stand out, perhaps with a brilliant location, an amazing water park, or sensational dining. Here's the cream of the Disney Orlando crop for a range of budgets, starting at the top. Disney's Grand Floridian is the top Disney-branded resort in Orlando, with room rates to match. Centrally set just one monorail stop from the Magic Kingdom section, Grand Floridian is as elegant inside as it is out. It appeals to hotel guests who like the tradition and charisma of a large, dignified resort whose guests feel part of its legend. The resort's gracious design-recalling Palm Beach's golden era of the early 20th century-has become a template for lookalike Disney resorts in places like Hong Kong. The Grand Floridian is loaded with guest amenities: club-level upgrades; a full-service spa; two vast pools with cabanas; one of Florida's most-awarded restaurants (Victoria & Albert's); and endless diversions for tots, tweens, and teens. Resembling an Amalfi palazzo, Four Seasons Resort Orlando at Walt Disney World Resort delivers high-end luxury in every way: accommodations, amenities, dining, service. One of the very best hotels in Orlando (Disney World or no) this is the only Central Florida resort to possess AAA Five Diamonds. Guests enjoy the Four Seasons brand's trademark comfort and beauty plus exclusive Disney offerings and access. Four Seasons Orlando delivers a superb vacation experience for guests of all ages. The resort steps up for young guests, treating them to a complimentary kids' camp and free meals for those under 5. Adults can enjoy an adults-only pool and a Tom Fazio golf course. Disney's Polynesian Village Resort brings the feeling of the South Pacific to Orlando, giving guests two vacation experiences in one. Though it is one of Disney World's pricier resorts, it's a lot cheaper than going to Hawaii. The Polynesian, one of the original Disney resorts from 1971, is still on the cutting edge, with top tech amenities alongside its kicky tropical decor and vibe. One change: more suites and villas. The resort​'s central location allows guests to do and see more. It offers its own station on Magic Kingdom's monorail line and easy access to the other monorail line to Epcot. The Polynesian's Spirit of Aloha luau meal is one of Disney World's hottest dinner reservations. Wear your Hawaiian shirt or muumuu and come hungry. Parents, the resort's kids club, Lilo's Playhouse, will entertain your brood until midnight. Dazzling modern design and dead-center convenience distinguish Disney's Contemporary Resort, a high-end property that is one of the three original Disney World hotels. It is near Magic Kingdom's gate, but catching the complimentary Resort Monorail as it breezes through the tower is even more fun. (Epcot is just one transfer away). Rooms are sleek and modern, with club-level upgrade options. The design centerpiece: a 90-foot-tall mural celebrating the American Southwest and Grand Canyon. Guests can splash in a waterslide or quiet pool; once dried and dressed, savor California Grill's coastal cuisine and 15th-floor view of nightly fireworks. Kids love the resort's immersive Pixar Play Zone, too. Disney's Animal Kingdom Lodge Resort is an African safari experience. This Deluxe resort, with a club-level option, perches within a 33-acre wildlife animal preserve. Its savannas and their critters are visible from many guest rooms, suites, and villas (tip: get one with a balcony). Among the exotic animals you'll spot are zebras, giraffes, and kudu (an antelope with spiral antlers). The imposing African theme extends throughout this atmospheric resort, with tribal art and artifacts, African flavors in three restaurants (Jika, Bomo, and Sanaa), and the waterfalls and meandering streams of Uzima Springs Pool. Disney's BoardWalk Inn Resort transports guests back to good-time seaside haunts like Atlantic City, Coney Island, Santa Monica, and Galveston. Like those summer havens, this resort's hub is a boardwalk entertainment district, with saloons, arcades, and a dance hall. Thye BoardWalk's splendid dining ranges from prime steak and fresh seafood at Flying Fish to fresh custard and saltwater taffy outdoors. The boardwalk itself is an ongoing carnival lively with roving musicians and acrobats. By day, guests soak up the vibe (and sun) at carnival-themed Luna Park Pool. The resort is considered Deluxe, with high rates and a club-level upgrade option. Accommodations include rooms and suites (some over the boardwalk) and a villa section. Guests are a quick walk to Epcot and a longer stroll to Hollywood Studios, where the big news is the summer 2018 opening of Toy Story Land at Disney's Hollywood Studios. Disney's Saratoga Springs Resort & Spa was inspired by the upstate New York town that was the United States's first resort: it offered early Americans thermal springs, saloons, and a racetrack with the country's only legal gambling. This Orlando counterpart shares the elegant antique look of Saratoga Springs, with a sumptuous spa in place of the Adirondacks' hot springs. One way this Saratoga Springs outdoes its inspirational town is with championship golf at the Lake Buena Vista course. Accommodations at this high-end Disney World resort range from trim studios to two-bedroom villas to adventurous Treehouse Villas high off the ground, with three bedrooms, two baths, and a kitchen. The resort is a pleasant stroll or quick boat ride to the Disney Springs area (formerly known as Downtown Disney). Disney's Art of Animation Resort is made for families that stay and play together. It offers smartly configured multi-bedroom suites with kitchenettes. The resort is a good value, leaving funds left over to spend at Disney World's attractions. The theme here is Disney's game-changing animation. It's on ample display, from its origins as flickering cartoon drawings to today's Pixar movies. Section by section, the resort pays homage to Disney productions past and present. Naturally, the pool–the biggest and most interactive at Walt Disney World Resort–celebrates "Finding Nemo," "The Little Mermaid," and other Disney sagas of the surf. Disney's All-Star Music Resort features just about the lowest room rates in Disney World. The larger-than-life theme here is music, with areas devoted to rock, jazz, country, Latin beats, and more. There's a tuneful surprise around every corner and a playful pool shaped like a (you got it) guitar. Harmonious families get comfy in the resort's one-bedroom suites with full kitchens and sleeping digs for six. Dining is informal. The resort's Intermission Food Court features the greatest hits of casual dining plus pizza delivery. The resort is set in the park's Animal Kingdom section. Nearby, and with similar budget-minded rates, are Disney's All-Star Movies Resort and Disney's All-Star Sports Resort. The Campsites at Disney's Fort Wilderness Resort is Disney World's best bargain. Many families return to its well-equipped campgrounds year after year (quite a few with their furry family members). The camp's 750-acre wooded site can accommodate every type of shelter that guests come with, from pup tents to massive RVs. Guests can also rent cabins with full kitchens and a variety of sleeping arrangements. Campsite guests feel close to nature, yet creature comforts are many: a pool complex; privacy-enhancing landscaping; water, cable TV electrical, and sewer hook-ups; a picnic table and charcoal grill. Back country diversions include trekking, kayaking, horseback riding, and wildlife spotting. The Campsites are in the Magic Kingdom section of Disney World, and boat shuttles whisk campers back and forth. 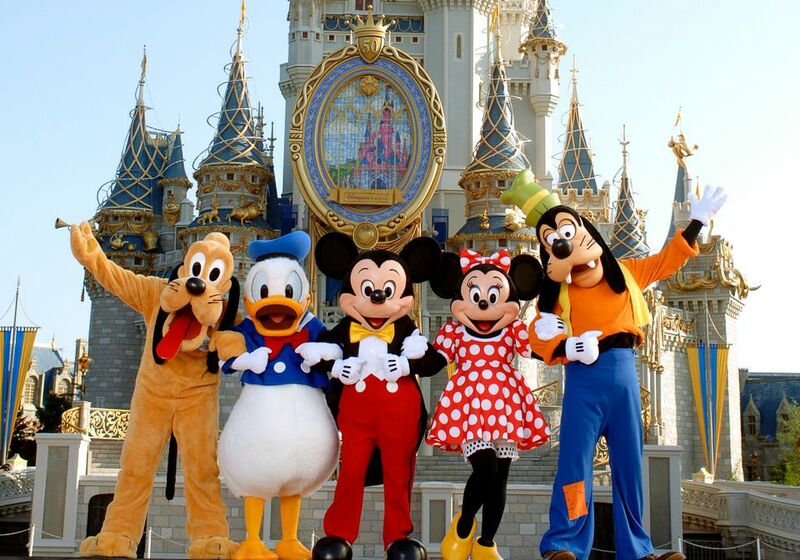 What Are the Best Priced Disney World Resorts? Which Disney Resorts Are Closest to the Magic Kingdom?